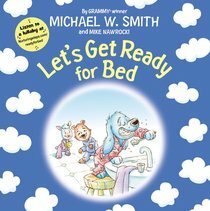 From Grammy Award-winning artist Michael W Smith and the co-creator of Veggietales Mike Nawrocki comes Let's Get Ready for Bed, the second in a series of bedtime books in the Nurturing Steps line. This sweet and sleepy picture book will lull your little one to sleep with their favorite stuffed animal characters the Nighty Nights. As an added bonus, this book includes a link that allows readers to listen to Michael W. Smith singing the lullaby from the story. Founded by Michael W Smith, Nurturing Steps is an infant and toddler series of children's music and books with a simple mission to enliven a child's journey with hope and faith through music and storytelling. This picture book features a cover that shines with foil. About "Let's Get Ready For Bed"
Mike Nawrocki is co-creator of the popular series, VeggieTales. Acting as the voice of Larry the Cucumber, and several other Veggie characters, Mike also wrote, directed, and contributed to the development of the 3-2-1 Penguins series. He resides in Chicago, IL, with his wife and 2 children.